The morning is a pearl. Not a twig moves in its shimmering globe. Not a bird stirs. All is tension between reality and potential – between now and later. Stasis. Welcome respite for some; anxious pause for others. The moment of keenest awareness before all the clocks in the world stutter and continue their endless, Sisyphean rounds. Hopeful chickadees have arrived now, and a junco, picking at seeds embedded in the frozen crust. My two rats have eaten well, and crafted a maze of tunnels through the drifts. They pop up and disappear like groundhogs. As the rains move in and the snow shrinks, they will lose their winter warren. I wonder if this will disappoint them. So much effort, such complexity – gone at the whim of Nature. Then again, isn’t that what happens to us as well? Mayan ruins, Roman walls and aqueducts, Sable Island spars drowning in sand … the winds passing indifferently over all this wrack and glory. “Cloud-capp’d towers and gorgeous palaces” dissolving, Prospero’s vision come to pass. But for now, for this hour, the rats build their corridors of ice. They never invade my human domain, for they have no need. I let them be. We live too far in the back country for pestilence to touch them, or me. A car crunches the frozen ruts on my road. Cash barks to be let in, his urgent business completed. 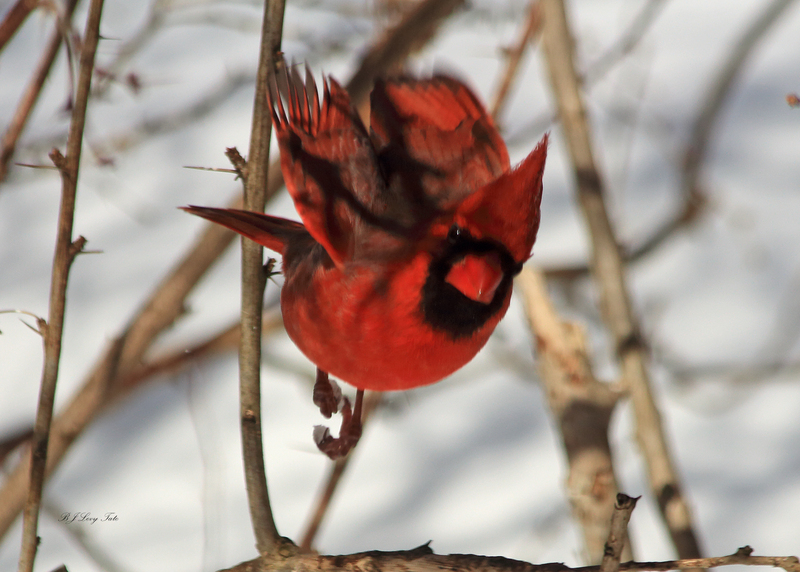 The cardinal enters with crimson flare. He is my Prospero, my Mage of the Snows. Someday, perhaps he will magick me to ancient Egypt or Uluru. Waking time is brief; sleep is long. And always, the pearl rolls away and the revels end.